Watch me as I earn One Million Dollars, in 20 steps or less, buying and selling stuff! Would life be easier if money wasn't part of the problem? I'm going to try and find out by earning one million dollars, legally, in 20 steps or less, while still holding down my job and keeping up with house chores, children and a marriage. I heard about this idea from my father who heard about it during a presentation at work 30 years ago. The presenter had an 18-year-old daughter who he claimed had already earned $18,000 using this plan. I've tried it half-heartedly before and stopped at $250 but am trying again and will document my experience. The premise is incredibly simple: buy something for $1. Sell it for $2. Buy something for $2 and sell it for $4. If you keep doubling your money in this way, after 20 steps, you will reach a million bucks. Looking at the list, you're probably thinking what I'm thinking; it's not that hard to buy something for $2 and sell it for $4, but how are you going to double your money when you buy something for $131,000? The answer: I don't know. But even if I get there in 40 steps instead of 20, that's still a million dollars I'll have at the end of this experiment that I don't have now. Note: This is a reverse-order blog: the newest updates are at the end. Click "Older Posts" at the bottom for the newest stuff! STEP ONE: What a Loser! LET'S TRY THIS: I was in a Goodwill store last week. I wasn't looking for anything in particular, but I found something that looked more valuable than it's price tag. In this game, you basically need to find something priced at 1/4 of it's retail value, or half of it's wholesale value. If you can find it, then you can usually sell it at wholesale to the public who expect retail prices. They're happy, and you're rich. 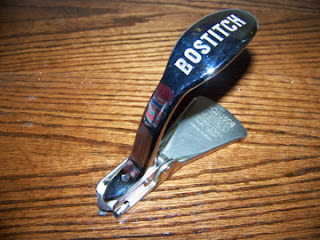 What I found in the store was a Bostitch staple remover. It's made to remove those nasty heavy copper staples from shipping boxes. It didn't have the box but it looks like new. It only cost $2. I know I skipped step one with this purchase, but when I came home I looked on Ebay and found several just like it for around $14 with free shipping. Those were listed under completed listings. If I can make $6 or $8 I'll be happy but really, I just need to make $4. STEP TWO: GAME ON! 400% Profit! I've got a good feeling about this one. Last night, I came across an ad on Craigslist for 3 handheld electronic games. Yahtzee, Fishing, and Monopoly. I quickly checked listings on Ebay and found out that ain't nobody goin' fishing these days with those little electronic handheld fishing games with the tiny reel on the side. Same goes for Monopoly games unless the electronic version is a huge one with lots of buttons, which this one wasn't. The seller was asking $10 for all three but he agreed to $5 for just the Yahtzee game from 1995. These aren't sold in this style anymore. There is a newer version available for $53 but it seems people prefer this older version for some reason. It's listed now on Ebay with an accurate description and some good pictures. We'll see if I can do better than I did with the staple remover. This time, I included a meager shipping fee. Three day auction... cross your fingers. UPDATE (12/2/11): The auction ended with 24 bids and the winner bidder came in with $26 to win the classic Yahtzee game. That's a WIN / WIN situation. Onto the next step! UPDATE (1/28/2012): Buyer comment from Ebay, "Good deal." I've made a few blunders in this experiment so far. Luckily, none of them have led to financial disaster yet. The biggest danger in this game is buying something you know nothing about. The only way to ensure that you'll turn a profit is to research the product ahead of time and know the ballpark that you can sell it for. Knowing that allows you to set your price limit for buying it in the first place. If you just wander into a yard sale and buy things that look cool, you'll have no idea whether they'll actually sell for double or not. This is the experience that clearly sets me apart from guys like Mike and Frank on American Pickers. They know the basic value of almost everything old. I don't. If there is a bottom line, it's that you should check everything on the item carefully. Open it, look on the bottom. Does it have extra features that make it more unique than other models? Does it look rare? Is it clean? Unusual? Two items I bought that I had some regret over were an antique electric fan and a pinball table. The fan was bought at the same time as the call box. I was feeling good about the honey hole I was in and figured everything there had high value. The fan was cool looking and I offered $40 for it, thinking I could easily double my money there. It was an impulse buy and when I got home and researched it, I found out that there are many fans like this that have been restored to gleaming quality and even then they don't go for that much. I still have it and perhaps I'll sand it, repaint it, rewire it and post it but not any time soon. Yesterday I got a call out of the blue about my 1930 Victor electric fan. I had just started to grow fond of the little fan and had visions of restoring it myself, as best as I would be able with my steel wool and Rustoleum spray paint can from Ace. I was elated to hear that the buyer was putting together a home office in period products and my fan would match his antique desk perfectly. Step Three: Bought for $40, sold for meager increase to $50. The second item I bought on impulse was a wooden pinball table top. It is from 1978, made by Gottleib, the leader in the pinball world at the time. This one caught my eye because it was co-branded by Columbia Pictures, as an advertisement for Arabian Knights. The game is called "Sinbad". It's got some cool graphics with a sword and a guy with a turban, not to mention a hot lady where the ball shoots out of the shooter lane. I offered $20 for it and got it home, only to find that the identical game, working, with legs, glass, backboard, and all wiring (none of which my game had) didn't even sell for $150 on Ebay. There was no way I'll come out ahead from this one, I thought. Then I put it on Craigslist and hoped someone would see the art potential in it. I included some pictures in the ad and even put the table up against a window with the warm setting sun behind it, allowing the sunlight to shine through all of the colorful buttons on the table. The next day I negotiated the sale of it to a guy for $50 (bought for $20). He was going to buy an LED light kit for it and mount it to the wall in his game room. It was a lucky finish to a risky purchase. I will try not to do that again. Step Four: Bought for $20, sold for $50. What Would I Do With All That Money? Assuming I get to $67,000, my wife and I have an agreement that we would "have a talk" about what I would do at that point in this experiment. In my eyes, I'd only be three steps away from a million. In her eyes, we could stop there and pay off all of our student loans, thereby wiping out 20 years of repayment yet to come (and thousands in interest fees). She has said that if we do that, then I am "welcome to start over" and let it ride all the way to the top. I'm thinking this instead: go for it the first time, go two steps further for $500k. With that we could pay off our student loans, pay off our home that we currently rent out (creating a nice monthly income), and perhaps buy the home we currently live in as well so that we are living rent free. If that happens, then I could start this thing over and if I get to the million, then that's all the more padding we'd have for all of those little expenses that come up like college, braces, car insurance for four drivers, and retirement. As a school teacher and presenter, I'm always looking for better ways to connect with young audiences. Recently, while in a local HabiStore (Habitat For Humanity re-sale shop), I came across a four-light table top stop light made for playing games in classrooms and presentations. It is called, "Who's First Game Show Buzzer". STEP SIX: Sound the Alarm! Incredible day on the Million Dollar Steps! I've gotten hooked on money making reality shows. I've watched every episode of American Pickers and Storage Wars on Netflix. And yesterday I had my own episode. It's been a month since my last purchase and I've been wanting to get back into the game so I started scanning listings on my local Craigslist. Casually attached to the bottom of an ad for some photographs of deer glued to disks of wood I found this cast iron box also for sale. It was once used to call the fire department from the street back in the 1930's. It sounded old and I went for it. What happened next was the biggest surprise I've ever had in the universe of buying and selling. STEP SEVEN: PAC 'em in, MAN... i mean, "Miss." Oh Yeah! Just when I thought I was stuck on a step - the phone rings... "How soon can I come over?" Bought for $120, sold for $480! When I get caught up in the excitement that an item I have may likely sell at or above my asking price, I start thinking about the next item I'll buy, or even the next three items. So far, I haven't bought anything hugely out of step with the plan but I have a feeling that situation might arise. It's hard to find something valuable at 1/4 it's retail price at exactly the same time I have the cash to buy it. Before the fire call box sold at that record sale price (by record, I mean of all the antique fire call boxes from NYC that I've sold), I had decided my next item would be a table version Pacman Arcade Game. Now, immediately (and if you're male), you may be thinking, "Awesome!" Others, like my wife, might say, "Okay... tell me more." How is this Affecting the Family? For the first few days when I started this project, my wife couldn't stop giving me sideways glances, as if she were assessing whether I'd just gone off the deep end. Why would someone be so freakin' excited about selling a handheld electronic game for twenty-some bucks? And then I sold the Fire Box and everything changed. Standing in the kitchen and showing her the bidding war that took place in the last 12 seconds of the auction and then showing her the final selling price, her gaping jaw was priceless. In the space of 90 seconds, I had gone from having a wife who tolerated her oddball husband and his financial antics, to having a business partner who was fascinated by my success and wanted to analyze how it was possible so that "we" could do it again. The kids haven't been immune to my new hobby either. Whenever we're in a store and they see something they want, they have now started phrasing value on things in terms of, "Daddy, this is a really good price, we should get it." Today, on the way home from school, my 6 year old even confided she's started a resale shop at school. She employs classmates to comb the school campus during lunch and recess and bring her interesting things: a pretty twig, a feather, a lost bead. Then she creates art with them by tying items together into creative collages and sets up shop the next day during recess. Using one chair on the classroom porch as her office, she uses another chair as the display case and students can barter with her to trade for things they want. I'm not sure how I feel about raising a young venture capitalist, but for a first grader, she's doing alright. We even joked in the car at the similarity between her and Tom Sawyer (which we're reading now) as she had to consider the offer from her classmates to let them help her in finding objects. She's now in the front yard selling artwork to the neighborhood adults as they come home from work. This could get out of hand. Did I Say Twenty Steps? In its purest form, I imagined this experiment as 20 individual purchases, each selling for double the price I purchased them. What I'm finding is that my plan may have been financially romantic. It's appearing very difficult to find an item for sale at just the right moment, at just the right price, just when I have the funds available. Let's call it The Impossible Trifecta. Some items I'm able to make 10% profit and others over 400% profit. Should I just go with the flow of this thing and truly try to buy something for the exact amount of change I have in my ever bulging piggy bank? Or should I do whatever it takes to attain a certain level of money which will allow me to buy the most lucrative item, even if that means adding supplementary steps in between? STEP EIGHT: A few freebies, or are they? When a neighbor joins in the excitement, how can I turn down an offer for free stuff? STEP NINE: From Free Yard Sale to SOLD! Some neighbors of mine decided to go out with the old and had a free swap meet. People could take anything they wanted for free. I waited around until everyone had taken what they wanted and at the end, I offered to clean up the rest. Most of it I took to Goodwill to donate, but a few items, at the invitation from the swap meet founder, I placed on Ebay. Here are the results. Now that's what I call a successful yard sale! STEP TEN: Let the Good TIME$ ROLL! As I mentioned in an earlier post, I've been pleasantly surprised that my wife has been very supportive of this project, particularly since I made nearly $800 off a $40 item. So it was even more of a surprise when she told me recently that she didn't think I was taking enough risk in my recent steps. "What about the plan? 20 steps? Doubling your total money each time, sound familiar?" she asked. I tried explaining that my new plan is to make money any way I can (though still by selling things, just at a lower price if needed) in order to make my total profit climb to the price of the next big purchase. So, I'm not abandoning the notion of 20 steps, but I think I'm being more realistic that at times, it may take a few intervening steps to get to the next major level. For anyone wondering why I need to get to some predetermined level before putting it all on the line again, the answer is that I can't just expect to find something for that exact price. Much of the time, I am at the mercy of the seller's asking price, part of the Perfect Trifecta I explained in an earlier post. Along those lines then of bringing up my total to some necessary level, I spotted this vintage beauty and had to jump on it, even if my own weight exceeded the limits of its design. Step Ten: Bought for $85, sold for $148. STEP ELEVEN - FOURTEEN: What other crap you got for sale? I think I know how hoarders get started. It's easy to see something and feel a strong desire to want to buy it. The potential to making money on something is a very attractive feeling when in the buying mood. If that isn't a surefire way to fill your house with crap, then tie me to an anthill and fill my ears with jam. This old enamel cigar sign ended up being the surprise winner of the items, yet again confirming that old stuff is gold. I paid $5 for this and sold for $43. I've been buying little things and even though I did terribly at math in school, I saw the writing on the wall. It would take years to get some real money if I kept buying and selling little things. This project is about going for it, right? Incrementally, take the plunge at each level and hope for the best? I don't want to jinx anything by boasting just yet, but I have a good feeling about it. Should be able to share some good news about the purchase of it by Monday. Then comes the scarier part of trying to sell it. Excitement ahead. Click on the little words "Older Posts" on the bottom right to see what I bought! I love to run, cook, and play the banjo. I do not like to worry about money.